Was it austerity that cost them the election? The surprise failure of the Conservative Party to win an overall majority in the British general election has been attributed to many things, including Theresa May’s demeanour, a gaffe over social care, and Jeremy Corbyn’s mobilisation of younger voters. But Nick Timothy, May’s former Chief of Staff who had to resign over the failure, suggests that many British voters were simply “tired of austerity”. For some, the appalling deaths at Grenfell Tower epitomise a government that has endangered the poorest in its ideological pursuit of a lower budget deficit. Others think that the government’s fragile position in parliament anyway must mean the end of austerity. So what is the legacy of austerity? And is now the time for it to end? Austerity began in 2010 when in the aftermath of the 2008 financial crisis the UK budget deficit had ballooned to over 10% of GDP, and the sight of the Greek economy imploding due to excessive government debt served as – or was used as – a warning. The newly elected coalition government under David Cameron introduced a programme of cuts in public spending with the aim of eliminating the deficit by 2015. Welfare benefits were cut, public sector pay was capped, and public investment was slashed. The budget deficit began to shrink, but more slowly than expected due to a weak economy and subdued wage growth. Then last year Britain’s decision to leave the EU prompted the new Chancellor, Phillip Hammond, to push back the deadline for eliminating the deficit to 2025. Now, with an economy seemingly close to full output, the deficit remains over 2% of GDP (See Chart). 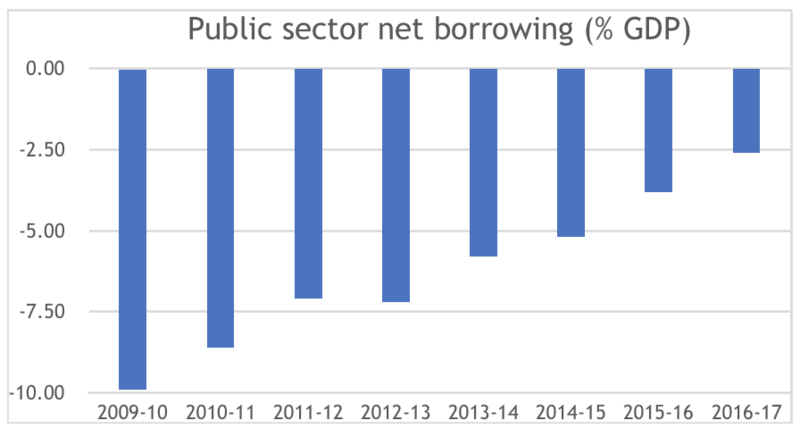 The failure to eliminate the deficit, coupled with weak growth and increasing strains on public services, has arguably cast doubt on austerity’s rationale in the first place. But Torsten Bell of the Resolution Foundation, a think tank, believes the true meaning of austerity lies in cuts to public spending, not the level of the national debt. So, he argues, if we want to know if austerity is finished, we should wait to see if the government lifts the cap on public sector pay and the freeze on benefit payments. Wren-Lewis has argued elsewhere that the lower growth caused by austerity means that the average UK household is now a cumulative £4,000 worse off than they would have been without it. His conclusion is that spending can rise, but so too must taxes if we are to put the public finances on a sustainable trajectory in the long-run. Seven years on, it is easy to forget the atmosphere of fear, bordering on panic, engendered by the financial crisis and bank bail-outs after 2007-08. The decision by the UK government to cut the deficit was an understandable (if not inevitable) response to the real possibility of a bond market rout. However, the academic consensus is now clear that the cuts in spending depressed growth and delayed the economic recovery, even leading to rises in the public debt-to-GDP ratio. And the choice to cut public spending on benefits and public services (while financing tax cuts and protecting pensioners) was neither rational nor inevitable – but, as Ben Chu argues, an ideological decision. The term “austerity” has been used to systematically confuse the question of whether to cut the deficit with whether to cut public spending – which, as Martin Wolf argues, are logically distinct. So, whatever we decide to do with taxes and spending in the future (and it is a political choice not an economic necessity), we would be better off jettisoning this dangerous term.